The weather’s turning spooky – the southwest is due to be hit by the ‘perfect storm’. 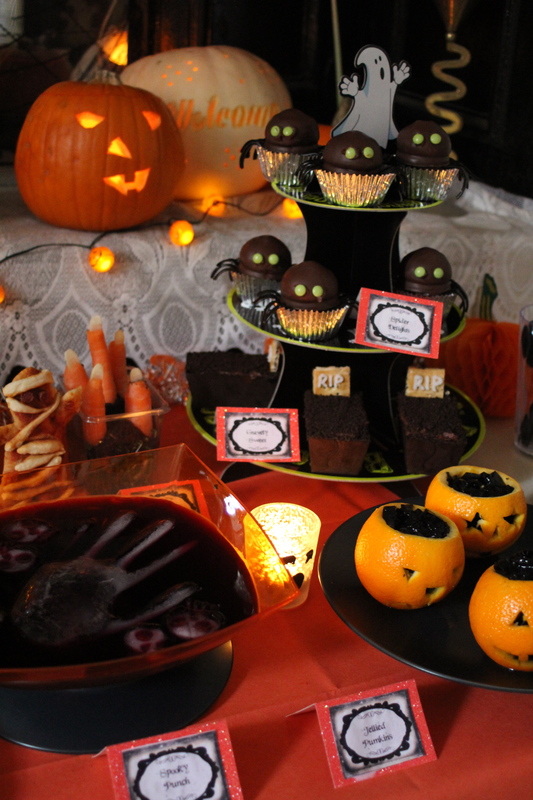 Halloween is almost upon us so we thought we’d share some of our ghostly creations for your Halloween Parties.We’ve had great fun tuning in to our slightly mischievous side working on these fabulous party ideas for Halloween. This week, we were fortunate to have a wonderful, and very atmospheric, Georgian fireplace to use as the backdrop for a Halloween party. 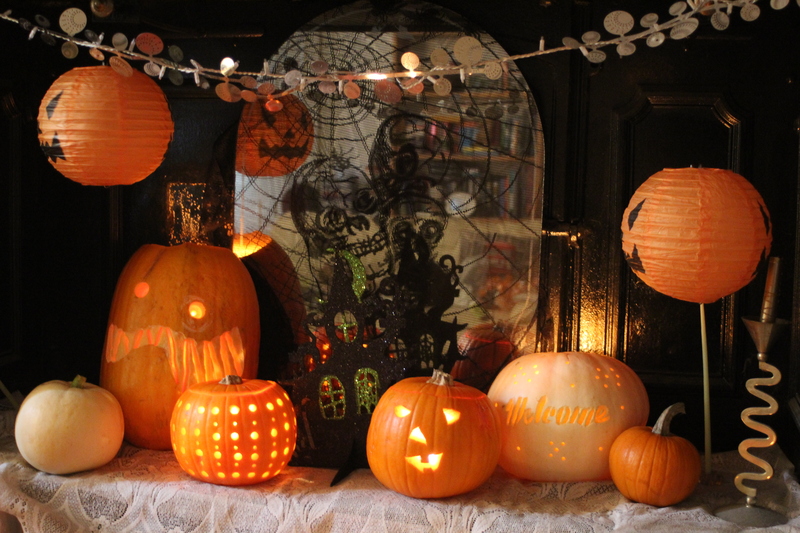 The fireplace itself has been adorned with our own carved pumpkins. 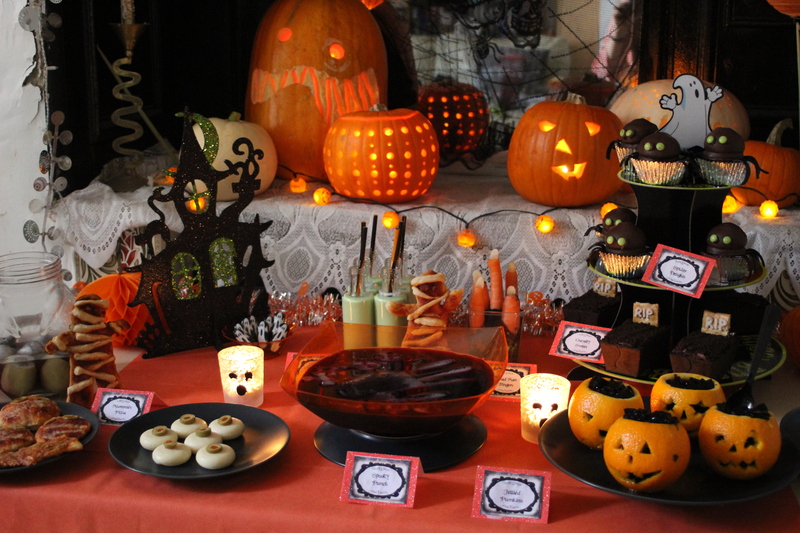 We’ve picked some great items from a local thrift store to decorate the table and fireplace – we particularly loved the pumpkin light garland and spooky black lace tablecloth, which we draped over the mirror. We served ‘Mummies Pizzas’, ‘Dead Man Fingers’, ‘Lizards Eyes’ and ‘Witches Eyeballs’ – the perfect potion for the cauldron, to start the ghoulish banquet. With ‘Spider Delights’, ‘Gravely Sweet Cakes’, ‘Jellied Pumpkins’, ‘Spooky Punch’ and ‘Frogspawn Shakes’ for no-trick treats. We’ll post some of the recipes over the next few days, but why not share some of your Halloween food ideas with us in the meantime? ← Clear the house, check out those community halls – traditional children’s parties are making a comeback!